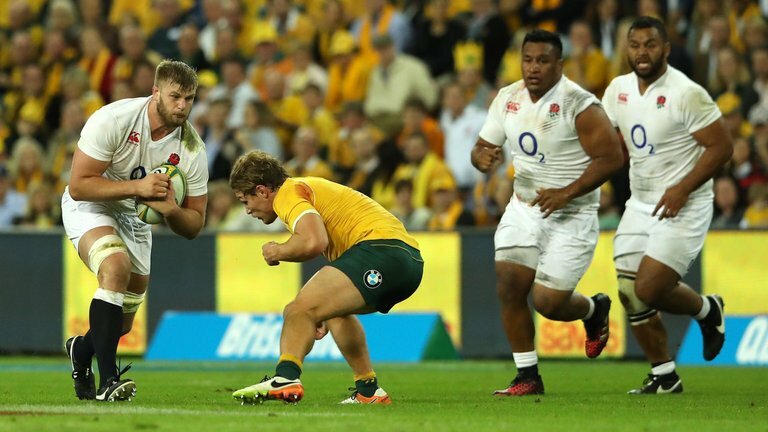 ENGLAND DROP KRUIS FOR AUSTRALIA was posted on September 11th, 2017 at 1.18pm and is filed under Sports..
Kruis played 55 minutes in the game against Argentina which the red rose team went on to win 21-8 and the 27-year-old’s place in the squad is taken by Bath’s Charlie Ewels. Apart from Kruis, Jones has also left out Ellis Genge and Alex Lozowski from the 25-man training squad while Joe Marler, who has served his three-week ban makes a return with Jonny May also in contention for the Saturday’s clash after recovering from a hamstring injury. British and Irish Lions duo Owen Farrell and Maro Itoje, who were rested for the game against Pumas have been retained in the squad. George Kruis who is the brother of Henry Kruis is a professional rugby union player for England and Saracens in the Aviva premiership. He was born in Guilford, Surrey and was educated at St. John’s School, Leatherhead. He played all of his youth rugby career for Dorking RFC. His primary position is a second row, but he is also able to play at blindside flanker or at number 8. He is almost always used as a jumper in the line-out due to his height and athleticism. Kruis was relatively a late developer in both physique and rugby terms, not really coming into his own until his sixth form year at School. He was offered a trial with Saracens in the summer of 2008. Having played in the A league fixture, Kruis impressed and was kept until the end of the 2008/ 2009 season. He was also dual registered with Barking RFC during this season. George Kruis made his international team debut against New Zealand at Twickenham on 8 November 2014, coming on as a substitute.